It is well-known that vitamins and minerals are important for our health. Our bodies are unable to produce most vitamins and minerals on their own, but need them since they play a crucial role in numerous processes. Because of this, these micro-nutrients must be obtained from the foods that we eat. Below are some of the best food sources of vitamins and minerals. If you take a look at the nutritional profile of an avocado, you will be very impressed. It contains almost every single common vitamin and mineral that you can think of, including vitamins A, C, E & K, the B vitamins, potassium, zinc, magnesium, phosphorus and iron. Commonly mistaken for being a vegetable, the avocado is in fact a fruit. And like most fruits, avocados contain a fair amount of carbohydrate. The majority of this is in the form of dietary fiber, with your average avocado providing you with 14 g.
Unlike most fruits however, avocados are also high in fat, most of which is in the form of heart healthy monounsaturated fat. It is for this reason avocados are quite energy dense, with a 200 g avocado having 320 calories. Many nutrients like vitamins A, D, E and K are fat soluble, which is why it is often recommended that you eat an avocado together with foods that are high in these vitamins, in order to increase absorption rates. Some of the benefits associated with eating avocados include their ability to lower cholesterol levels, protect your eye health, prevent cancer and assist with weight management. There’s plenty of ways to enjoy avocados: mash them up and spread them over toast like you would ordinary butter, add them to smoothies or use them to prepare fresh guacamole. Eggs are among the healthiest foods on the planet. If you think about it, they are quite remarkable because they contain all of the nutrients that are needed to turn a single cell into a chicken. A single egg will provide you with decent amounts of vitamin D an B12, which a lot of people are often lacking in. This is in addition to nutrients such as iron, phosphorus and selenium. Eggs are also one of the best sources of protein, with a large sized egg providing you with 6 g. Eggs are a complete protein source, which means they provide all 9 essential amino acids that the body is unable to synthesise on its own. It is true that eggs are high in cholesterol, all of which is found in the yolk (this is also where most of the vitamins and minerals are found). Cholesterol is a controversial topic, but studies seem to suggest that eating 3 whole eggs per day is perfectly fine for most people. If you are worried about cholesterol in your diet, speak to your doctor so that he or she can advise you on how many eggs you should be eating. There are a wide variety of nuts and seeds out there: almonds, pistachios, cashews, pumpkin seeds, sunflower seeds, Brazil nuts and walnuts. They all have one thing in common though; they are an excellent source of macro and micro nutrients. Take almonds for example. A 28 g (1 ounce) serving has 6 g of carbohydrate, 14 g of fat (most of which is monounsaturated) and 6 g of protein. Together with this, they also have large amounts of vitamin E, calcium, iron, magnesium, copper and manganese. Additionally, nuts are a source of powerful antioxidants, which help to reduce damage caused by free radicals in the body and protect against oxidative stress. This in turn helps to reduce the risk of diseases like cancer. Nuts are a calorie dense food but can be eaten whether you’re trying to lose or gain weight; what matters most is the amount that you eat. 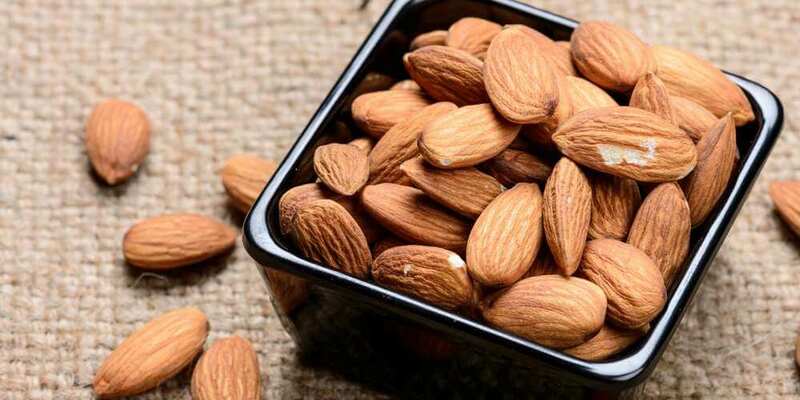 For example, a person who is trying to lose weight could have an ounce of almonds (163 calories) as a filling snack. On the other hand, a person trying to gain weight could add 4 tablespoons of almond butter (392 calories) to a smoothie. People are told time and time again to eat plenty of greens, and the reason for this is quite simple: these vegetables are loaded with vitamins and minerals. As an example, a single cup of kale will provide you with more than 200% of your daily requirement of vitamin A, more than 100% of your daily requirement of vitamin C and close to 700% of your daily requirement of vitamin K! There is also certainly no shortage of green vegetables. You are spoilt for choice, with options including broccoli, Swiss chard, asparagus, zucchini, Brussels sprouts and bok choy. Because these vegetables contain large quantities of water (which has 0 calories), they are very weight loss friendly foods. You may be surprised to learn that a single cup of spinach has only 7 calories! You can enjoy these vegetables in all sorts of ways: stir-fry them, use them as the base ingredient for soups, salads and green smoothies or incorporate them into numerous delicious recipes. Fish is very nutritious. Besides containing large quantities of high quality protein and nutrients, it is also a source of iodine and vitamin D, the latter of which a lot of people are deficient in. There are many varieties of fish that you can eat, but the fatty kinds like salmon, tuna and trout are considered to be the healthiest. One reason for this is because they are loaded with omega-3 fatty acids, which help to reduce inflammation in the body, thereby reducing the risk of many diseases. Eating fish has been associated with lots of benefits. Some studies have shown that fish consumption is linked to a reduced risk of cardiovascular disease, slower cognitive decline and improved sleep. Fish is delicious and can be baked, grilled, steamed and stir fried. There are also plenty of fish recipes on the web for you to enjoy. It is important to eat high quality fish; if your budget allows, opt for wild-caught over the farmed variety, because the former tends to be less contaminated with toxins. Blueberries, blackberries, strawberries and raspberries are all chock-full of nutrients. However, the one nutrient that they contain very large quantities of is vitamin C. In fact, when compared weight for weight, strawberries contain more vitamin C than oranges do. Berries (and especially blueberries) also rank very high when it comes to antioxidant content. They are a rich source of flavonoids and are believed to contain the highest antioxidant capacity among common vegetables and fruits. As previously mentioned, antioxidants are important because they help to fight off disease. Berries are generally lower in calories and sugar than other types of fruit. This means they come in handy when trying to lose weight, especially if you have a sweet tooth. Eating berries may also help lower blood pressure, prevent heart disease and improve brain function. One way to enjoy berries is by preparing homemade sorbet, which can be eaten as an alternative to ice cream. All you have to do is freeze some berries in an air tight bag overnight and then blend them in a food processor until they are a nice creamy consistency. Legumes are a controversial subject. Some people will tell you foods such as lentils, beans, chickpeas and peanuts are super healthy, whereas others will tell you to avoid them at all costs. What is certain is that these legumes have impressive nutrition profiles. For example, a cup of cooked kidney beans will provide you with calcium, iron, magnesium, potassium, zinc and manganese. They also have large amounts of dietary fiber and protein, which makes them a filling food. Unfortunately, legumes are a source of anti-nutrients, which are substances that can affect the absorption of other nutrients. These anti-nutrients include phytic acid, lectins and saponins. Luckily, some studies have found that soaking, sprouting and fermenting legumes can help to reduce the amount of anti-nutrients. It is important to thoroughly prepare beans before eating them, because they can cause food poisoning. It is recommended that they are soaked in water overnight and then cooked in boiling water for at least 10 minutes. Chocolate is obtained from the seed (also known as the bean) of the cocoa tree. High quality chocolate (which is the dark kind that has undergone very little processing) is bursting with minerals. These include iron, magnesium, phosphorus, potassium, zinc, copper, manganese and selenium. We mentioned previously that blueberries have a high antioxidant capacity. However, this study found that the antioxidant capacity of cocoa powder is significantly higher than that of blueberries, when compared gram for gram. Because of this, eating dark chocolate can bring about many health benefits. It is important to keep in mind that the chocolate we are talking about here is the slightly bitter kind that is made up of 70% or more cacao solids. Milk and white chocolate do not bring about the health benefits that eating high quality dark chocolate does. It is common knowledge that dairy products are high in calcium, but they are also a rich source of a variety of vitamins and minerals such as phosphorus, the B vitamins and vitamin D.
Types of dairy products include milk, yogurt, cream and cheese, all of which have fairly different nutrition profiles. For example, 100 g of whole fat milk has 113 mg of calcium and 10 mg of magnesium, whereas 100 g of cheddar cheese has 721 mg and 28 mg respectively. Most people can digest dairy quite well, but it should be avoided entirely or eaten with extreme caution if you suffer from lactose intolerance. This is because consuming lactose (the sugar that is naturally found in dairy) when your body is unable to digest it can lead to cramping, flatulence, bloating and vomiting. In particular unprocessed grains such as oats and quinoa, both of which contain significant quantities of iron, magnesium, phosphorus, potassium, zinc, manganese, B vitamins and antioxidants. They also have large amounts of dietary fiber and protein, which makes them very filling, with quinoa being one of the very few plant based complete protein sources. Eating unprocessed grains can help to improve blood sugar control, relieve constipation and lower cholesterol levels. Grains are also very affordable and easy to include in one’s diet. There are lots of foods that contain large quantities of vitamins and minerals. At the end of the day, it is important to include a variety of nutrient dense foods in your diet. This will reduce your risk of suffering from vitamin and mineral deficiencies.